Want great accommodation at dirt-cheap prices? Why not try secret hotels? What are secret hotel rooms? Even the best hotels can’t fill all their rooms 100% of the time, so they sell the excess at deep discounts. But if everybody knows about the price cuts, their reputation might suffer and their other guests probably won’t be very happy. So even though these rooms are sold on certain booking sites, the hotel names are not publicized. Why book secret hotel rooms? 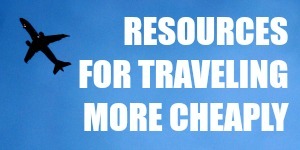 You often can’t get a better deal even if you booked directly with the hotel. In fact, you know how some hotels have a lowest online price guarantee? If you check the fine print, they usually say specifically that they will not match secret hotel deals. Why not book secret hotel rooms? Because there are fewer options and less information about the room. If you have very particular preferences — hot tub on the balcony, salon-grade hair straightener, elliptical machine in the fitness room — you should probably go with a regularly priced hotel room. And because these are unsold hotel rooms, naturally they’re only available at the last minute. You’ll have to make the booking quite close to your actual trip. Also, the booking site won’t let you see the hotel name from the get-go. You’ll have to make a decision based on the few details provided — usually star rating, neighborhood, check-in/check-out times and amenities. But don’t worry about this; there are ways to uncover the hotel’s identity and I’ll go through them soon. Where can I book secret hotel rooms? DEAL ALERT: $10 Off $100 Hotwire Hot Rate® Hotels With Code: FALLSAVINGS10 Sept 21-22 only. Ready? Let’s start with a hotel search. Once you click on one particular hotel listing, you should see more information. The TripAdvisor rating and number of reviews. Scan the description for a distinctive feature. In this case, this hotel won a TripAdvisor Certificate of Excellence, so I highlighted and copied that sentence for later. How can I figure out the hotel name? 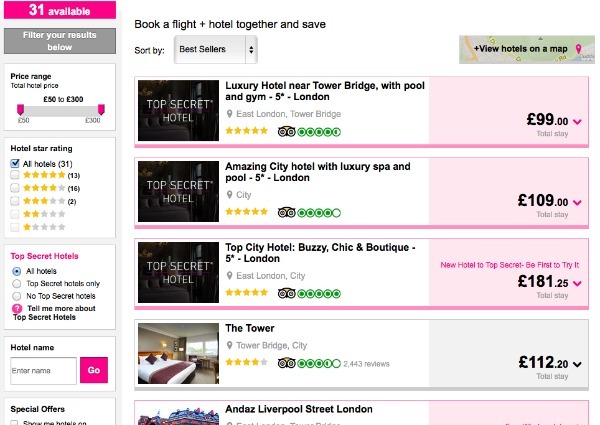 The booking site often uses the same description for both its secret hotel page and its regular listing page for the same hotel, so all you have to do is copy a snippet of the description and paste it onto Google. Choose the most unusual phrase or sentence in the listing to get the most relevant search results. If the secret hotel has a distinctive feature — a rooftop whirlpool, for example — your job would be super easy! Here’s what happened when I pasted the sentence I copied from the listing onto Google. You don’t have to leave the booking website to find out what the hotel name is. Look at for all available hotel rooms in the city, then narrow down the results based on the features of the secret hotel. 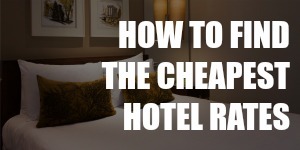 Some sites make this process really easy by showing how much the room usually costs, so all you have to do is find the hotel room that costs the same. You can also sort the results by star rating and neighborhood. If there are only three hotels that match your criteria, then the secret hotel must be one of them. Dig down deeper into the details in the hotel descriptions, matching the amenities of the secret hotel with each regular listing. In my example, lastminute.com showed the hotel’s regular price, so I quickly found a match. 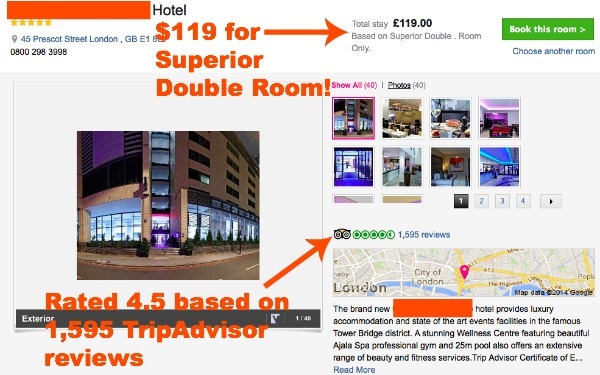 I checked out the listing and look what I found: same star rating, same price, same room type, same TripAdvisor rating and same number of TripAdvisor rating! With lastminute.com Top Secret Hotels and Hotwire Hot-Rates , you’re shown both the hotel’s star rating and its TripAdvisor review score. You can use these details to confirm your guess. 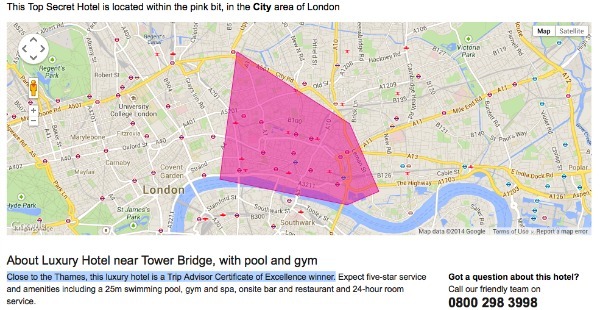 Head to TripAdvisor, then search for hotels in the same general area with the same user review score. 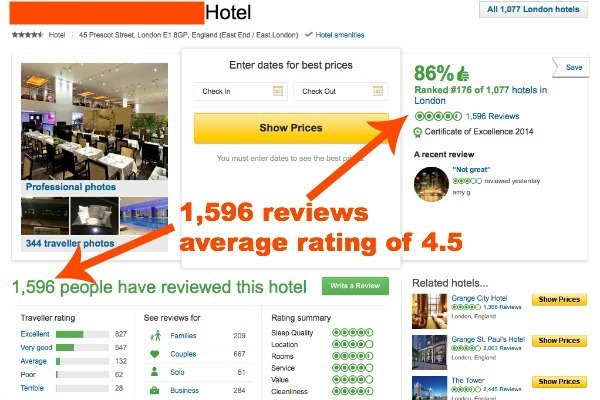 Don’t sort your results by star rating; you’ll soon see why. See? The same rating and almost the same number of reviews! Maybe someone had just added another review and lastminute.com hadn’t updated its listing yet. It also received a Certificate of Excellence. Jackpot! Pay attention to the star rating; this hotel was listed as a 4.5-star hotel on TripAdvisor and that’s because star ratings are quite arbitrary. The same hotel often has different star ratings on different websites. In identifying a secret hotel, star ratings are more useful for when you’re scanning the booking website where you originally found the secret hotel deal. One hotel would have the same star rating on the same website, regardless of whether it’s a regular listing or a secret hotel deal. For example, Hotel X may be shown as a regular 4-star hotel on website A, but it’s appears as a 3.5-star regular hotel on website B. If both websites have secret hotel deals, then Hotel X would be shown as a 4-star secret hotel deal on website A and as a 3.5-star secret hotel deal on website B. 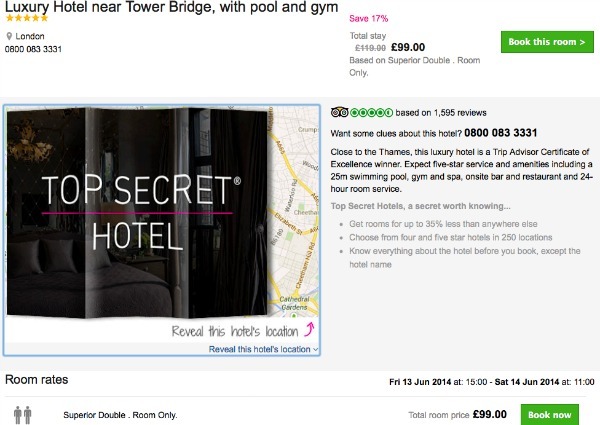 Is it really always cheaper to book a secret hotel room? I don’t like to make sweeping statements with words like “always” and “never” because there are bound to be exceptions to the rule. But I will say this: a secret hotel room deal usually really is the cheapest rate available for that particular room. If you want to be sure and you have some time to kill, take a couple of minutes to check the price of that hotel room on other hotel booking websites. I recommend HotelsCombined to check a few booking sites at once, TravelPony because its rates are often the lowest (even though they don’t usually have many hotels there) and Tingo for its price drop guarantee. 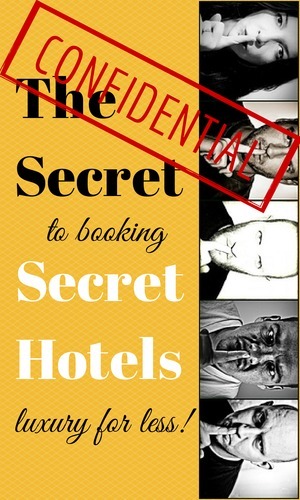 If you’ve booked a secret hotel before, let me know how it was for you! Image: Adapted from a photo by Flickr user AndYaDontStop (CC BY 2.0 License). Ha! I am the number crunching and travel planner in the family and I do the same exact thing. I love it and it works to get those deals. Nice that you took the time to spell it all out. When you are actually doing it, the process doesn’t feel so long. Yes, I guess we are of like minds and apparently like torture too. 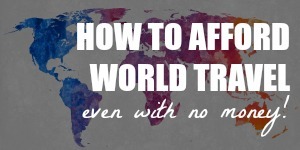 Great post, I will definitely try out your tips as I am getting sick of Booking.com! Great post! I always overlook these hotels because I want to know what I’m getting. I’ll definitely give your tips a try. I used pretty much this same method when booking a hotel in Copenhagen last summer and it worked great. We were fairly certain we had figured out the hotel in advance through the description and TripAdvisor ratings and we were right. It was such a great deal! I was a big fan of Hotwire a few years ago, and this post reminds me that I should give them a try again. On the other hand, I like to get points while I travel (for future rooms and amenities), and secret hotel rooms do not allow that. 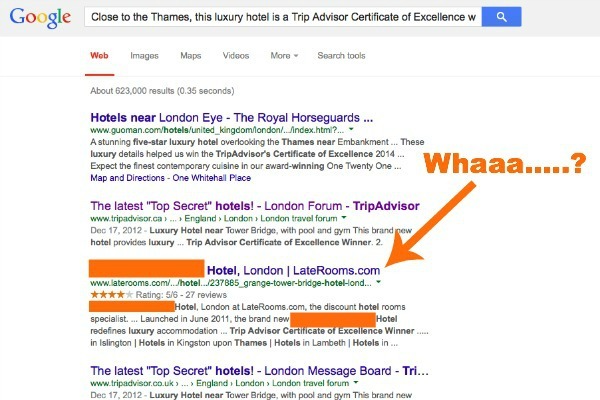 Good idea to try to sleuth out what hotel it is. I’ve seen these deals in the past but was always worried since I didn’t know the exact hotel. I never thought of just figuring it out!